My husband and I are now the kind of people who go to conventions. We have reached that level of nerddom. We have achieved a new geeky status by attending our very first gaming convention. We are now those people. This year we drove three hours to attend Origins Game Fair in Columbus, Ohio and we loved it. We really wanted to go last year too, but it didn’t work out. We didn’t sign up in time to get into any of the games and we didn’t really plan for the whole thing and we had fifty thousand weddings to go to that summer so it just wasn’t in the cards. This year, we were slightly more on top of things. We signed up only a little late, (we would have been on time if the registration hadn’t been down when it should have been up) and managed to get into at least half the games we wanted to try. We had to get a hotel room five minutes away from the convention center instead of attached to it, but we’ll talk about the hotel later. We were all set to attend our very first gaming convention and my husbands very first convention ever. As you may know, I’ve been attending the Tekko anime convention in Pittsburgh for the past three years. I thought the center in Pittsburgh was big. I mean, it’s the bigger than the one in Monroeville, at least. Origins makes Tekko look like a picnic. The convention center itself is huge and it’s attached to a hotel, extending it’s size even more. Half of the time we spent between games was trying to figure out where our next game was. They really need a better map system, their maps were spread out between the guide book and the events list, which was practically a phone book. Anyway, we were a bit overwhelmed by the size of it this year, but I think next year should be better since we have an idea of how it works now. The funny thing is, we would mention this being our first convention and how big it was and almost everyone else responded with “Oh this is nothing, you should see Gen Con.” Gen Con is the big gaming convention in Indiana that basically all the people go to. We don’t think we’ll ever go because it sounds terrifying and the general consensus is that Origins is just as good, but less crowded. Our adventure started with finding our way around the convention center after we finally found somewhere to park. The parking situation was actually not as bad as I was expecting and they had a convenient glass bridge connecting several garages to the center itself, which was very nice. Once we figured out where we were supposed to be we spent the rest of the afternoon and evening playing Edge of the Empire to kick off our Origins experience. The Star Wars role playing games use their own set of dice, which was an interesting system to learn. It’s pretty simple, all things considered, but weird nonetheless. Come to think of it, we should have gotten some of those dice while we were there. We really enjoyed learning how to play and joining in the first two parts of the series. I got to blow up a building, it was great. What trip is complete without hotel struggles? Having forgotten about the booking thing early on, we were a little late to the hotel party, so we ended up with a more expensive hotel that was a little ways drive from the center itself. What we didn’t realize was how very special this hotel was. It was huge, to begin with, which isn’t a bad thing, just bigger than we’re used to. It also, apparently, had just switched to a new valet company so that was also a mess. We didn’t know that they only had valet parking and no adjacent lot for themselves until we got there and couldn’t find the parking area. We had a choice of paying lots of money to have them park our car, or pay slightly less money to park somewhere close by and walk back to the hotel with all our stuff at 11pm in a strange city. We paid the little bit more and decided to just take a Lyft the next day so we didn’t have to deal with it. Of course we came down the next morning to find our car had either not been put away or they had brought it down for someone else. I’m inclined to think the former but either way is bad. We were not a fan of the hotel we stayed in. Aside from the weird valet issues, which included an unclear payment system, the room was pretty funky. They had outlets on the side of the nightstands, which is fine, except mine wasn’t plugged into the wall because a musical clock was more important apparently. I had to pull out the table to unplug the clock and plug in the whole power strip that wasn’t plugged in. Question: if they had a POWER STRIP with like five slots, why not plug that in and then plug the clock into the power strip? The world may never know. I will give it the one bonus point of being not freezing like most hotel rooms. After surviving our very first ever Lyft experience, which was a little awkward, but less scary than imagined, we began our second day at Origins with a game of Shadowrun Anarchy. I’ve played Shadowrun once before and really enjoyed the setting. It’s a d6 system which means it uses a pool of six-sided dice to determine outcomes (that’s your usual board game die). Shadowrun Anarchy is a rules light version of Shadowrun, which means there is much less number crunching involved with determining if you failed or succeeded or how much damage you did or what have you. It’s more focused on the story telling aspects of the game, which we like. I didn’t get to do much as my character wasn’t really suited to the mission we were assigned, but I did get to outrun an explosion, not because it was necessary, but because my character had to make a saving throw to not do the most dangerous option available and she failed. Logan was less impressed with the game than I was, but is interested in trying the system again sometime. 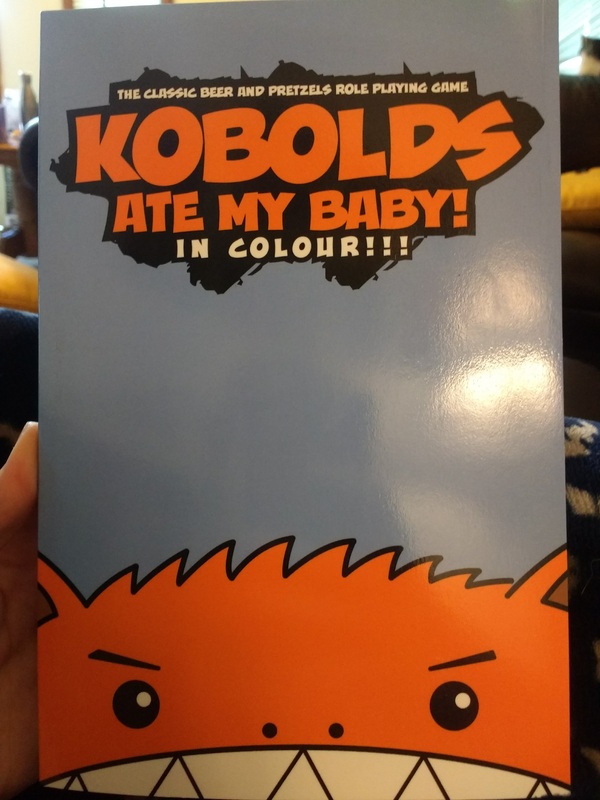 We got a break to eat lunch then, though we’d only eaten breakfast a few hours before, and then moved on to try out Kobolds Ate My Baby, a simplistic semi-role playing game in which you play as a group of kobolds trying to please King Torg (ALL HAIL KING TORG!) with tasty food stuffs. Kobolds, for those who don’t know, are creatures invented basically to get 1st level characters to 2nd level. They’re not very smart or tough, they just cause a lot of trouble and get killed by adventurers mostly. Basically the game consists of players running around trying to steal food from a village and bring it back for victory points. You roll dice to see if you succeed in actions or to see if you die a horrible death for various reasons. It’s a very simple, silly game that we had a lot of fun trying out. So much fun, in fact, that we purchased a copy of it for ourselves to play with our friends. We did skip the midnight massacre event, though, as we were already pretty drained from the whole day and ready to go home around 7. We did get to look around the dealers hall for a while before they closed, though, and bought many dice and a lovely picture of a tea dragon in a tea cup. Day three dawned very early and we dragged ourselves out of the hotel room by 7:30 Am to grab some breakfast before our first game. This was one of my favorite parts of the convention center, actually. They have this great food court with reasonably priced food and everything. Most of the food was pretty good, too, for being food court food, and we didn’t have to venture out of the Convention center at all. We ate nothing but junk, of course, with the exception of one salad split between us. But it was a very good salad. They even had a super hipstery coffee shop tucked away in the back, which we discovered on the last day, of course. It was very good, though, so we’ll probably frequent that more next year, hopefully. The Starbucks on the second floor was always pretty busy. Our final day fell mostly in our comfort zone with a game of 5th edition D&D and a final game of Savage Worlds, both of which we have lots of experience with. 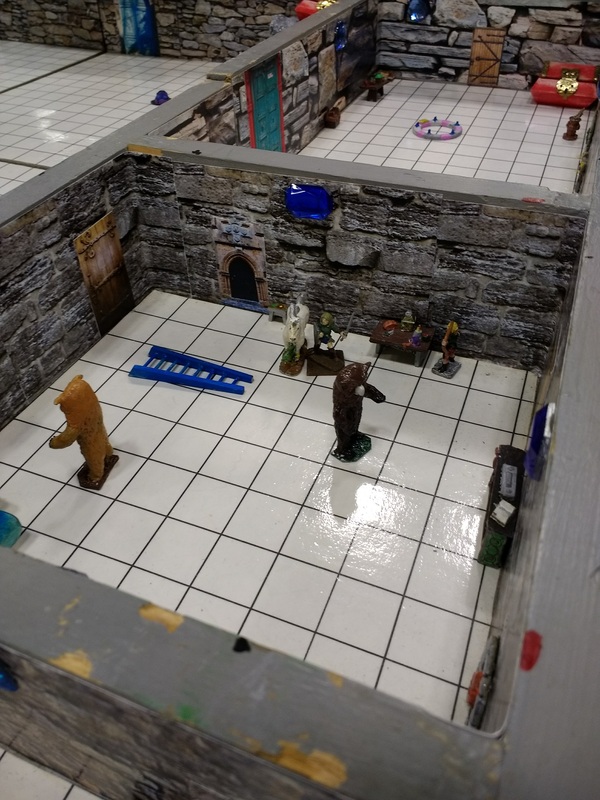 To start us off, however, we played in a dungeon crawl in Original D&D. We didn’t realize it was a tournament until we got there, of course, but enjoyed ourselves nonetheless. It ended up being just the two of us for our time slot. We had an hour to explore the 3D model map with our minis, fight monsters and find as much loot as we could before time was up. The person with the most gold won and got their name on the tournament board and entered into the championship round on Sunday. We weren’t there on Sunday, so it didn’t much matter, but I did win our round with 600-some gold, twice what the closest previous winner had. I’m thinking it was probably because we played with only two people. It was a lot of fun, every different from what the system has evolved into. D6s were used for initiative, which was interesting. We had a good time. We sampled a sneak peek of the latest season of Adventure League for our 5e game. I thought I had a fighter from the last AL game I played in, but apparently I forgot to save it. Thus, Logan and I both ended up playing pre-mades. He got a fighter before me, so I went with a cleric, just to try it out. I’ve never played a cleric before, or any real spell caster in 5e, so I figured it’d be interesting to try. I kind of like the class, having tried it out a little. It could be interesting to explore more with. I didn’t actually heal anything, mind you, I just “burned” things with my sacred flame and blessed my companions once. First level only gets two spell slots, though, so you know. Our final game of Origins was a time traveling game show in the Savage World system. It was actually really cool, taking us into six different situations to try and retrieve six stones to win the game show. I was originally concerned that it would be a contest type deal, but as it turned out, we were all working as a team to win the game, which makes it much more enjoyable for me. We each got to play a major roll at different points in the game and each challenge was different and interesting. It was a 4-hour game, but we had a lot of fun and it was a nice ending to our three days at Origins. And that was our first convention adventure. 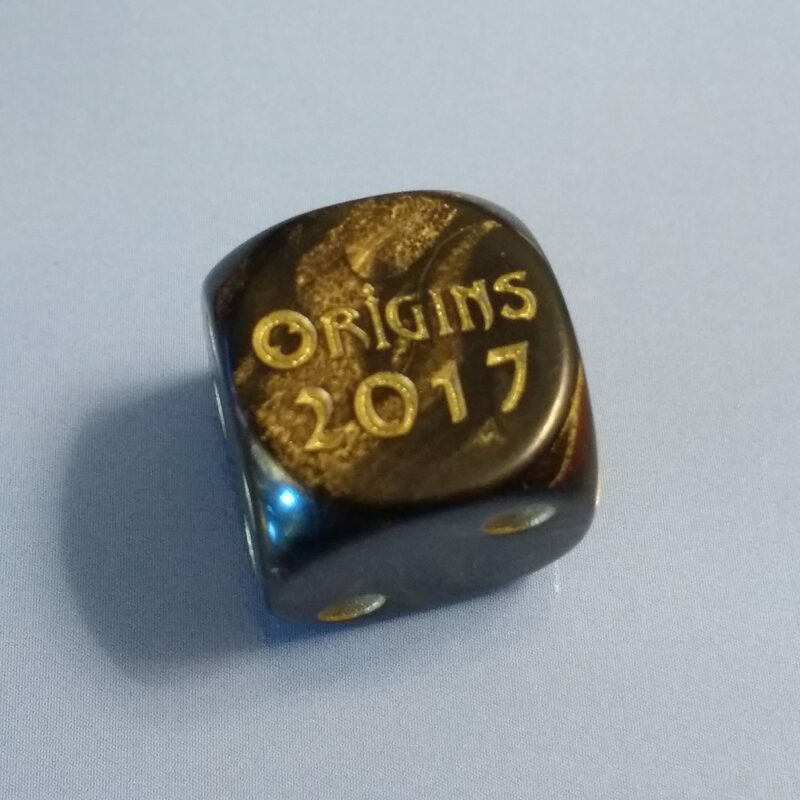 We had a lot of fun at Origins Game Fair and I’m sure we’ll be back next year for more gaming fun. Now that we know how everything works, for the most part, I’m hopeful that next year will be a much smoother experience. We plan on reserving a room earlier to hopefully get a room in one of the three hotels connected to the convention center itself. We hope to register for games earlier to get a few more new games in there as well as the systems we know and love. Hopefully we can plan in some more time for browsing the dealers hall as well. We did some general looking, but mostly we were searching for Kobalds Ate My Baby and some dice. Over all, though, we had a great first convention and look forward to many more to come.